Wow, but it’s been a long time since I’ve done a comic book review! I looked back and I think the last one I did was in 2011 for the Batman: Year One movie (which doesn’t quite count, does it?). Well I’m hoping to remedy that! I’ve love doing book reviews here on my blog, because as an author, I think it’s important to show some love when you finish a book. It’s tough out there for us authors, and every bit of love you can give back is appreciated. I also love reading comic books though, and I find again and again that really great comics don’t get the attention they deserve, either because they’re considered juvenile despite the wide acclaim the comic book movies have gotten in the past decade, or because people don’t think it’s worth the money. For me, I think comic books are a perfect mixture of art and story, with both methods adding together for a very unique experience. So since I got a good number of votes over on my Instagram story for it, I’ve decided to do a full review for the Fear of Faith series of comics, that were released back in the early 1990s. They featured my personal favorite Bat-villain, The Scarecrow. The first issue of Fear of Faith shows up in Legends of the Dark Knight #116. It takes place during the No Man’s Land series, which is when Gotham City is hit with a huge earthquake. When the city is practically annexed from the United States, most people evacuate, but the ones who are left work to carve the city into territories. Resources are low and Gothamites are forced to work together or battle it out in order to survive. This of course includes some of Gotham’s notorious villains, such as the Scarecrow, who we find horrified on the title page. 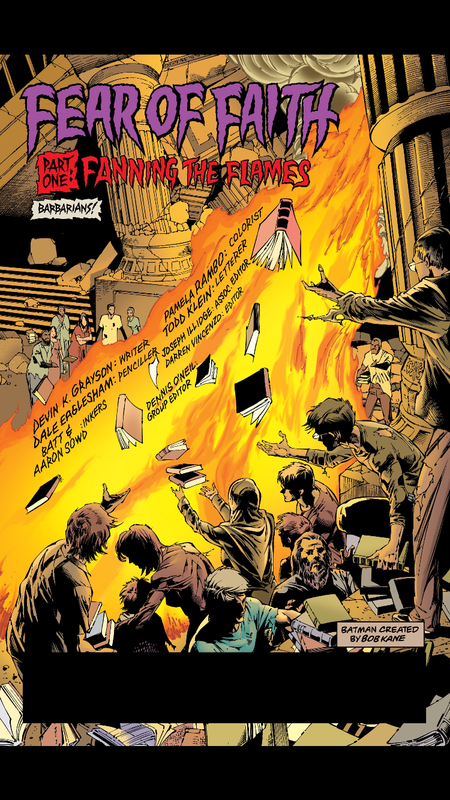 Scarecrow is watching a huge bonfire made of burning books, and knowing that he’s an academic, he’s outraged. One of he most wonderful lines in this book is when he states “I have never known a cold so bitter that it must be staved off with books.” And if we take into account the Scarecrow: Year One series (which I hope to review later), we know that he has probably experienced many cold nights. Scarecrow values knowledge above all else, even if it means life and death. His attention is pulled though when one book is not burned: the Bible. Suddenly the tone is set for how Scarecrow plans to harm these people: through some form of religious manipulation. We’re introduced to a church that is run by Father Chris. His church accepts anyone who wishes to be part of it, no strings attached, and he also rejects any attempt at police protection. Across town we see a gang who used to work under Black Mask, but who now travel together. They break into a morgue in order to fish out any bullets from the corpses there. It’s distasteful work and morally repulsive, and one of the members, Mikey, refuses to be part of it and gets ostracized from the group. Batman questions him about it, and we later discover that he drops Mikey off at Father Chris’ church so he an have a safe space separate from the gang. We find Jim Gordan having to sleep in jail cells since presumably the Gotham Police Department building is no longer livable. From him we learn that he has tried to convince Father Chris to allow the police to protect his area, but he refuses, claiming that he has immigrants who would be intimidated and frightened by their presence. Then Huntress approaches Father Chris, trying to get them to allow her protection. However once again Father Chris refuses. Then Huntress finds that the Scarecrow is casually reading a book, and she goes into attack mode. Father Chris has to remind her that she has no authority in his church and that everyone, even someone like Scarecrow is welcome. We start to understand the dangers of Father Chris’ decisions, but also understand what it looks like to others taking refuge there when Huntress attacks him. And we have setup the moral dilemma here between Huntress and Scarecrow, who turn out to be our main contradictory characters for the storyline. Huntress, unlike Batman, has no trouble killing but she is also a very religious woman. She is more a vigilante than Batman is, and often is far more violent. There are several pieces that make this story fascinating to me, as a Scarecrow fan. First of all, this is one of the few storylines where Scarecrow must work without his famed toxin. This turns this short 4-book series into a game of politics and persuasion. The series really puts his mind to work, which I rarely see from many comic books. Another piece I enjoy is that each of these books have Scarecrow’s mental dialogue going throughout. They show as the dark tan speech bbubbles with jagged edges we saw in the first screenshot, but often have him diving deep into philosophical and scientific or even chemical concepts. In this book, he tackles the question of why humans fear other humans. This runs alongside Huntress attacking Scarecrow and the violence that ensues, almost as a parody of the events taking fold. Inside the Scarecrow’s mind, we see that even when he is being attacked, that he sees himself as winning. This is evidence of his mental instability, and sets the stage for what happens next in the series. Despite the numerous points of view in this comic, it gives us a really juicy setup for the trouble and danger we know is coming. Despite Scarecrow requesting Father Chris to take him in out of kindness, we see that he only wanted to get closer to start his philosophical battle. I hope you enjoyed this! 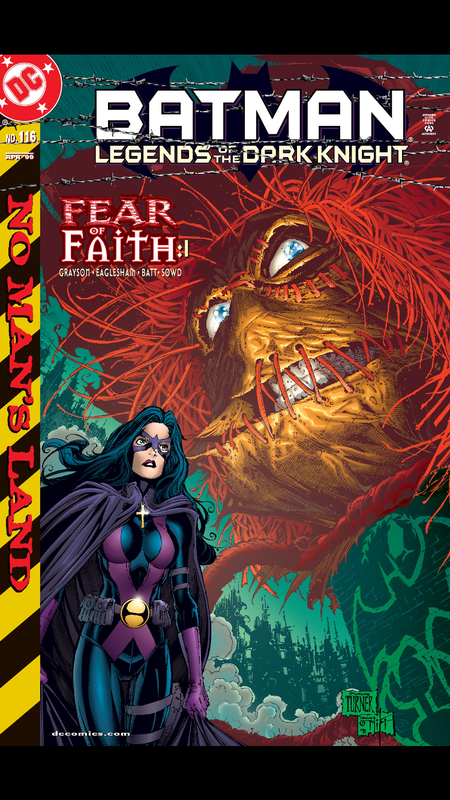 I’m looking forward to doing a deep dive into parts 2-4 of Fear of Faith, where we learn the Scarecrow’s plans and see what’s in store for Huntress and Batman! So today is Gini Koch’s birthday, and I thought writing up my review for her action-packed Urban Fantasy novel, The Night Beat, was a great way to celebrate! This book is an incredible roller coaster ride of action, monsters, and special guests. Yes, this book features such surprises as H.P. Lovecraft, Edgar Allen Poe, and (no, I’m not joking) Queen singer Freddie Mercury. That should give you a good idea of the kind of wacky adventures that ensure and the kind of world you’re jumping into. Victoria Wolfe is an undercover werewolf who works as a police officer to protect Prosaic City. What starts out as fighting an unspeakable monster that’s taking out the city’s unfortunates turns into a fight bigger than heaven and hell. It’s pulpy, it’s hilarious, and it’s intense from page one to the end. I absolutely loved it and am looking forward to her next book! Is it a fun read? Absolutely! This book is like a fantastic fever dream of your favorite horror and action films. Would you recommend it to others? If you enjoy fast-paced, pulpy stories with a heavy dose of intricate world-building and a slew of inhuman characters, then yes! Does it stick with you? This book is so unique and unusual that it definitely sticks with you. There’s just nothing quite like it. If you’re subscribed to my mailing list, then you already know how busy things are around these parts. We’ve planning a book launch party over on Facebook, there’s the second blog tour going on right now, and I’ve had a guest blog about my nightmares posted up on the Parliament House Press Blog. Basically things are hopping, and I’m just trying to keep all these things straight haha. The reviews for The She-Wolf of Kanta have been coming in and they’re just so GOOD. You can check out my Facebook Author page or my Twitter feed for links to all that’s going on, but let me try to break down all the things. Come chat with me about werewolves! Enjoy the giveaways! Maybe even see me on video. This is taking place all day on Tuesday, April 17th, so make sure you drop in and enjoy the fun! There are interviews about what I keep on my nightstand, deleted scenes that are seeing the light of day for the first time, reviews, and even a giveaway! It’s great to wake up every morning like it’s Christmas and see what’s been posted. I’m forwarding these out to my Facebook and Twitter feeds which will hopefully make it easier to keep up with. Check out the schedule below! Right now I have one festival finalized, but I’m waiting to see if any of the three other events pan out. For me, this has been one of the more stressful things – not because I’m shy about being around people (I can thank cosplay for helping with that haha), but because they’ve been kind of crazy to organize. I think I’m starting to get the process down now though, so expect to see more announcements down the road. I’ve been going to the Geranium Festival for years and it’s always fun to see what’s available! I think I still have a black and white picture of my sister and me dressed for the Old West from a few years back. So it’s crazy to think that I’ll actually be a vendor there this year! I’ll be sharing a tent with Morbid Smile, Heartfelt Knots, and a few other crafty friends. If you bring your copy of SWoK with you, I’ll be happy to sign it too. Come by and say hello! I’ve done several of these for the Parliament House Press Blog, trying to pull back the curtain on the writing process and talking about time management, the hard road it took to get to publication, and how my nightmares inspire me. That last one just got posted yesterday! 1/31 – No Time To Write? As hectic as it’s been, I’m looking forward to doing this all over again in January 2019 when Stolen gets released! I’m thrilled for The She-Wolf of Kanta to finally see the light of day after years of thinking her story wasn’t marketable. I can’t wait for you all to visit Kanta and experience Mercy’s world. I hope you’ll join me next week when SWoK gets released! Meanwhile I’m off to go organize the rest of these posts and events! Let me start by saying that the world building involved in the creation of this book is phenomenal. You don’t quite get how detailed it is when you first pick it up. You don’t understand the magnitude. Then you reach your first footnote, and then it dawns on you. Not only has Clarke breathed life into these diversified characters, but behind them is an enormous tapestry that serves as the backdrop for their world. Having just finished this giant 920-page behemoth, I think I’ll start with what made me love it and rave so fondly over it. The world feels like it’s been painted on a canvas. From the battlefields of Waterloo to the sleepy, cozy visage of Venice. Clarke has quite a way with her descriptions, and at times it feels as though her world makes more sense than our own. In this world, magic isn’t something questioned or pondered about over a cup of coffee, there was actually a king with one foot in the real world and another foot in the magical world of fairy (don’t worry, I’ll get to the historical aspects of the fairy world in a little bit.) Magic is something that need only be awakened to give it power. It exists just beneath the surface, and all it takes is a scratch to bring it forth. Magic though has grown out of taste, so to speak, and the world has forgotten it. The history has been rewritten to better suit the tastes of those in the present, and therefore there does not seem to be any real need to explore magic further – especially not the magic of the aforementioned king. A surprising aspect of this book is that the magician who you will likely identify with better isn’t introduced until well into the novel. I suppose when you have so much heft to your manuscript, you can afford to belay your star character until a little later on. Mr. Norrell isn’t a bad guy exactly, he is just very particular. That is to say, he’s stuffy, socially awkward, and despises change. So it’s surprising to see that he is the main instigator in the revitilization of English magic. At times he can be insipid, simple-minded, cruel, and a downright thief. However, you understand why he does it. You don’t approve of his actions, but you don’t think he should be shot for it either. He’s a rather unlikeable main character, and then once he surrounds himself with scoundrels like Drawlight and Lascelles, he becomes a bit of a puppet between the two. Then comes Jonathan Strange, an entirely different type of magician. He is gregarious and sociable, but since he has more wealth than he knows what to do with, he ends up going into magic out of boredom. Once Strange becomes Norrell’s pupil, that’s when the real meat of the novel comes forth. It takes a good chunk of the book to get to this point of course, but the build-up is quite worth it. When Strange goes to assist the British military in the Napoleonic wars, and then is targeted by the fairy “gentleman with the thistle-down hair”, you find yourself pulling at your hair. He never does what you want him to do, when he ought to do it. He can be very short-sighted, and (as apparently many magicians do), buries his head in books for far too long. This is quite an interesting set of characters for the reader to be rooting for, but you do indeed find yourself understanding both sides of their tale. The way that the fairy world is handled was perhaps my favorite aspect of the book. Frequently in folklore fairies are seen as tricksters, deceivers, and shape-shifters. It’s amusing to see how an entire land of the fairy world could be so similar to the real world, but not quite the same at all. Seemingly innocent locations are turned into horrific scenes of slavery and servitude, and arrogant or overly curious bystanders could find themselves forever trapped in a spell. The fairy world isn’t just a place down the road, or in another country, it appears as another reality, and frequently overlaps with the real world in ways that you wouldn’t imagine. At one point when Strange views this disconnection of worlds, he watches a man walk down a typical street, deftly dodging various tree branches in the fairy realm which he can’t see, but intuitively knows that they are there. It’s a subtle magic, and the craziness of the fairies reminded me very much of the Endless seen in the Sandman series, though not nearly as cohesive. The main fairy that we follow is arrogant, petulant, and his powers are too great for him to manage them properly. I am a very slow reader. I take my time with books, especially ones as complex as this, so it was quite a time commitment for me to choose to read this book. My friends had been urging me to give it a try, promising that I would love it. At over 900 pages (in my eBook copy at least), that was a difficult decision. I could easily see this being divided up into three parts like the Lord of the Rings trilogy, but the plot is so complex that I imagine some readers would find it hard to pick up where the story left off. The ending, though it closes all the loose ends so to speak, didn’t leave me very satisfied. I wanted to find out more, and I wanted to know the ultimate fate of our two main characters. The fact that this wasn’t clear made me a bit sad, but to be honest, when writing a book this long I could imagine she was reluctant to add even more onto it with a more detailed ending. I would have stayed along for the ride, though I could see some jumping the bandwagon when it went beyond 1k pages. The footnotes take some getting used to. They span several pages, and can be quite engrossing. The end result is that you’ll find yourself reading through pages of footnotes at the end of a chapter, and forget what was going on in the main storyline. It’s truly a testament to the breath and depth of Clarke’s world, but especially on some eReader devices, I could see this causing problems. My personal copy didn’t link back easily to the original footnote, and frequent bookmarks can cause confusion. It takes the flow out of the writing somewhat, but usually the footnote stories are quite enjoyable, so I honestly can’t count this against the book too much. I can say without hesitation that this book was easy for me to give five stars on. Sure the length is intimidating, but that really shouldn’t dissuade you from trying it out. It’s worth the time, and you’ll appreciate it once you’ve finished it. Especially if you’re a fan of fantasy, surreal worlds, and the Victorian era. Is it a fun read? Absolutely! Toward the end of the book, I was having trouble putting it down, and flew through a few hundred pages without even realizing it. The build up can be slow, but the pay off is very worth it at the end. Would you recommend it to others? Oh yes, definitely. It’s probably going to be up there with epic fantasy tales that I love (I’m a die-hard LotR fan), and it will certainly influence my views of magicians from now on. This almost felt like a case study of two magicians, so I feel like I’ve been given a behind-the-scenes look at the daily troubles magicians have to deal with. Harry Potter has a lot of politics in his future, that’s for sure! Would you re-read it? Simply due to the length, I don’t think so. However I’m a big highlighter and note-taker. I’ve peppered my copy with plenty of markings to keep me entertained the next time I’m picking it up to flip through a few pages. Does it stick with you?Can’t you tell? 🙂 The original friend who recommended this book told me that she was disappointed when she got to the end. She had gotten so used to being immersed in this Victorian pseudo-realistic magical world that it was sad to have to leave it. I found I had the same trouble myself. It sticks with you so much, that you’re frustrated that you can’t find more written on this very eclectic mixing of genres and styles.Though, I guess I could hop over and read on The Ladies of Grace Adieu, but I think I’ve left my partially read Dark Tower Book 4 gathering dust for too long, and I need time to digest this book a bit more. For such a long read, it’s going to be with me for quite some time. I had been looking for a copy of this since it came out in November, but I wouldn’t just deal with whatever version happened to be at the local Wal-Mart. I was rather peeved when they carried two versions of the DVD copy, but no Blu-ray. One version had the Catwoman short and the other one didn’t – and the only difference in price was $2-$3, a marketing decision I just don’t understand. I get having a Blu-ray and a DVD version, just not having two separate DVD versions. I guess a couple of dollars makes a big difference in this tough economy though. 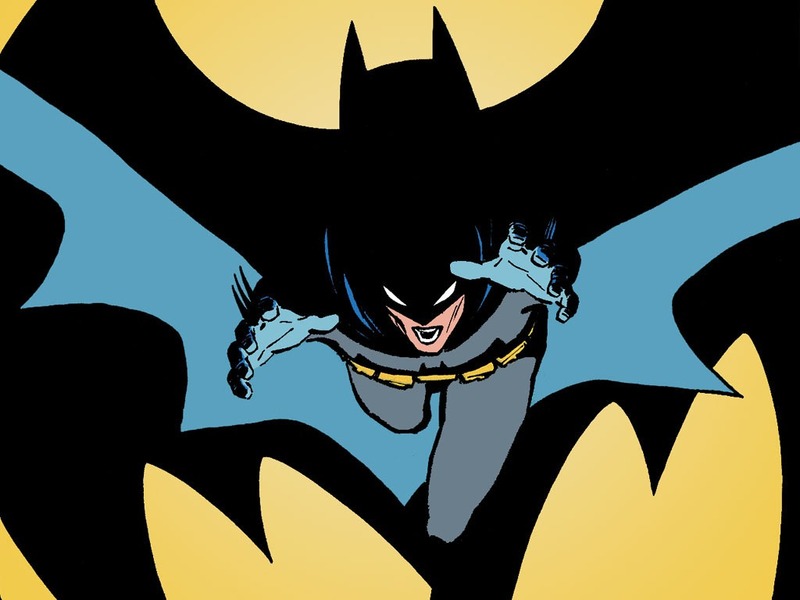 Let me just start by saying that I’ve loved Batman: Year One for quite some time. I think I first read it back in the mid-nineties when I was in junior high and was eating up the Batman universe. Sure, I had been loving this universe for quite some time, but that was my peak-fandom era I would say. We would go through every summer and catalog our comics, making sure each had the proper type of bag and backer board if we could. Let me add though that reading this epic graphic novel is not a prerequisite to enjoy this film. They worked extra hard to get the look and feel just right, and the gritty glamour of Gotham City is on stage throughout the film. This graphic novel was one of Batman’s best forays into film noir, in my opinion. As one of the commentators in the extra features explained, this story isn’t just about the beginning of Batman, but about Commissioner Gordon’s first steps in Gotham. It’s as much his origin story as the Caped Crusaders, and he feels like the underdog in his dogged fight against corruption within the very police force he’s been transferred into. The voiceovers are dark and succinct, perfect for a film noir piece. Frank Miller’s caustic ambivalence and hopelessness carries over quite well from comic to screen. The camera shots and angles felt like they were pane-by-pane along with the comic – and they follow the action beautifully. There is no shaky-cam like what is seen on many modern films, or delayed shots that don’t quite keep up with the action. The audience can follow every step of the way as an amateur Batman struggles to survive in a city that’s been given orders to kill. I’ve got to take a moment though to compliment this film on including one of my favorite scenes though. 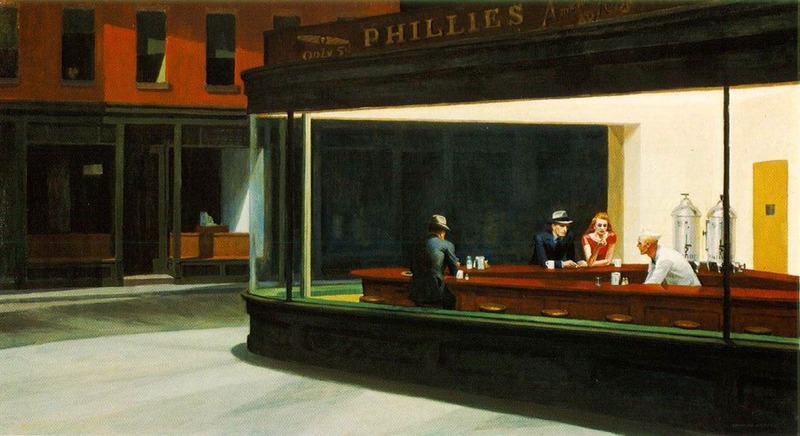 In the comics, there’s a shot with Jim Gordon and Detective Essen sitting in a diner late at night, which shares a striking resemblance to Hopper’s “Nighthawks”. They didn’t have to keep this shot in the film, but I absolutely love it that they did. It’s a testament to how much this film embodies the graphic novel. Here are a few shots from the comic followed by Hopper’s original “Nighthawks”, just to show the resemblance. Don’t you love how it’s even labeled Hopper? 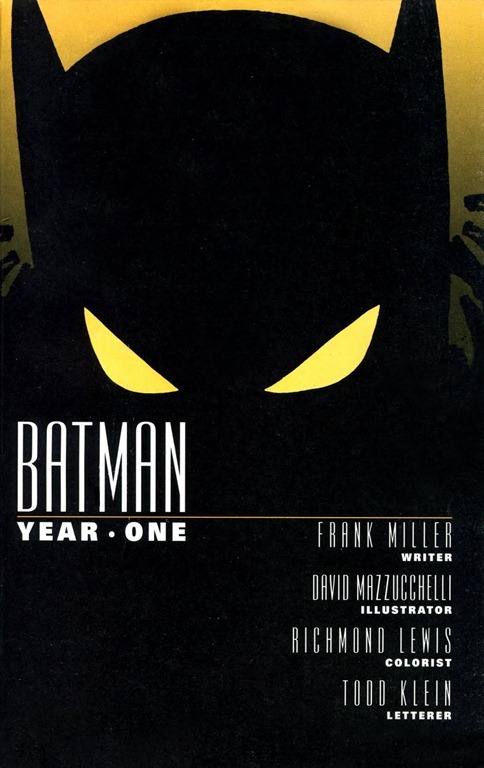 Batman: Year One in short got all the parts right that I was hoping for, and then some. If you’ve never read the comic but love film noir, or just love a raw and vicious version of Batman, then I think you’ll love the film. This was the inspiration for the look and feel of both Batman Begins and The Dark Knight after all, so that ought to be reason enough to go pick up a copy. Without this piece, Batman would never have been made so realistic and down-to-earth as he is in these films. Oh and did I mention it’s also on Netflix? Now if only the DCAU creators would consider doing “The Long Halloween”, “Dark Victory”, or maybe some villain origin stories like “Scarecrow: Year One” – it would certainly make me a very happy Bat-fan. Come to think of it, seeing “Arkham Asylum” put to film would just be divine, if not downright creepy! So what would you like to see the DCAU creators put to film next? Mark Hamill has said several times that he would come out of retirement to do “The Killing Joke”. I for one would add that to my movie shelf without hesitation! * There’s some interesting critique for Hopper’s work that I referenced a while back. If you want to read a bit more about his style of work, I recommend checking it out.